Looking for a yummy kid-friendly scone recipe? 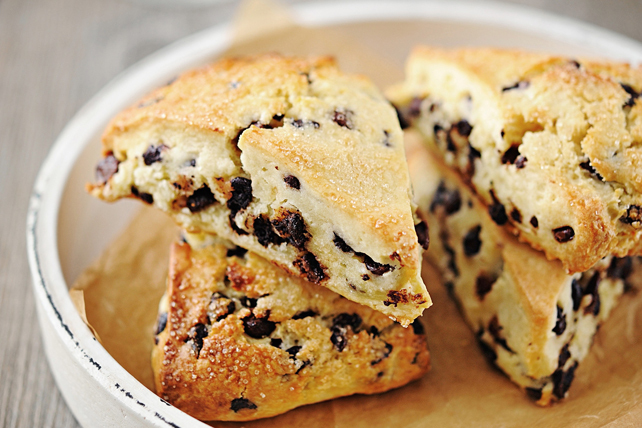 Our Chocolate Chip Scones is guaranteed to be a hit with kids of all ages! Combine flour, baking powder and 1/4 cup sugar in large bowl. Cut in butter with pastry blender or 2 knives until mixture resembles coarse crumbs. Add 3/4 cup milk, egg and vanilla; stir just until mixture forms soft dough. Stir in chocolate chips. Divide dough in half. Pat out one piece into 7-inch round on lightly floured cutting board; cut into 8 wedges. Place, 1 inch apart, on baking sheet sprayed with cooking spray. Repeat with remaining dough on second baking sheet. Brush with remaining milk; sprinkle with remaining sugar.